Last Friday, we reported that the North American Club Nintendo would be offering multi-coloured 3DS XL charging cradles from 31st October, costing members 500 coins apiece. As expected, they sold out quite quickly - they were reportedly gone within the first hour of appearing on Club Nintendo. It was no lie when it was said limited quantities were available. Did you manage to grab the 3DS XL's companion during the short period in which they were available? Let us know in the comment section below if you were lucky enough to purchase one, and which colour you opted for. Thanks to VoiceOfReason for the tip! I would be upset, but I have nowhere near 500 coins, not to mention an XL. Still wish I could've grabbed one though. Thankfully I did not want one of them. I would still love them to put the golden nunchuck again. I checked before work, and they werent up yet. I checked periodically at work in the morning about every half hour. Not up. I went to lunch, came back, they were all sold out. I did manage to snag a blue one. Did anyone get the same back ordered status in the orders inquiry section by chance? It took my coins and sent me a confirm order e-mail, but the status is still "back-ordered". I don't think they allow back orders, so I either will get one of the first batch, or have dibs on the next batch? EDIT: Nevermind. I apparently made it on time, because the status changed from "back ordered" to "preparing order". Better luck next time guy From what I could tell, the cradle went up at 11 a.m. mountain time. Hope that helps. Wow, am I glad I jumped on this when I did. My coins have been piling up due to my lack of interest in the other rewards, so I was pretty much sitting there refreshing the page until the cradle finally popped up. Managed to snag a red cradle for my red and black XL right away, then shortly afterwards the page went down for maintenance. Guess I got pretty lucky. Wow... People really wanted those things! I totally forgot about these until today. @sinalefa How many coins did the gold nunchuk cost? I heard about it after the fact, but would love to pair it with my zelda remote. Come to Europe, silly cradle. The charging cradle was actually gone within 15-20 minutes. I was waiting for it to show up yesterday morning, checking Club Nintendo frequently. About 15-20 minutes had gone by when I checked one more time and they were already gone. I wanted yellow for my Pikachu 3DS XL, then I was gonna get white or red incase I needed a back up and so I could collect all the colors. I don't understand what's so special about a cradle that I set my 3DS in.. I have 600 points unspent and I'm still waiting for something worthwhile to spend them on. I just don't get it I guess. Maybe I should have got one just to sell it on ebay. @Spuratis This is the XL cradle, not only can you not buy the XL ones in stores in the US, but its not included with a 3DS XL. How are these things so popular? I don't even use my cradle. You can't even play while it's charging that way. Plus they don't look THAT good if you ask me, kinda bland. I never got to even see them listed. I waited, they didn't pop up, left my computer for 10 minutes and they were gone. I am actually quite pissed that they made so few. @Yosher They are popular because there is nothing else on Club Nintendo worth while. There has been like 1 thing added in 2 years aside from the other limited time offers. They were selling on ebay in less than an hour upon release. Most people have 1500 coins+ in NA because NoA just forgets about Club Nintendo and doesn't care. Looks designed better than the 3DS model. Not quite. Some colors were sold out within an hour, but my brother got his (yellow) 1-2 hours after they came out. It probably took 2-3 hours for every color to sell out. As for myself, I got a white one for my mom right after they were added. I didn't get one for myself because I prefer the black cradle in the Nintendo store. Yeah... I had to sign up to comment on this. I too was waiting anxiously to try and grab one (yet had work, so couldn't check every hour). I was sooo mad when I logged in to try and get a blue one, and they weren't up, then MAYBE an hour or two later they were gone. Check ebay, and "Oh look. Some jerk decided to sell one already." Effin' scalpers and stupid Nintendo and their limited supply. I mean, seriously, if they're that limited, why not just NOT advertise it and then let people be randomly surprised when they log in on Halloween? All that for a pointless accessory.. They went up at 1:30pm Eastern Time. They were gone at 2:41 Eastern Time. Blue was the First "Sold Out"
I made sure to time everything and note which order they became unavailable. One Red and One Green! @SCAR392 I tried for a blue one but got a site maintenance message. I then tried again for my second choice, white and got one. I was checking the site every hour on my phone because our work network blocks gaming websites. It was around 11:20 a.m. MST that I noticed they were available. A friend tried one hour later and they were gone. Site maintenance lasted for about 5 minutes. One for my Red XL and one for my paid off in full Zelda Gold XL Pre-Order! Also. as of 5pm, I recieved Shipping confirmation! I picked up two! A yellow one and a white one! @WTV_94 Not bad for free. I was able to snag 2 blue ones. @ikki5 wow, I just realized i have that many coins, i wouldve got the hanafuda cards if I didnt already get the extremely awesome Silver and clear mario playing cards as my platinum gift last year, oh well, time to go buy some 50 buck statues of link and samus, they are poseable and completely worth it. I was on the fence about getting one of these and decided not to pick one up. I realized I sometimes play my 3ds xl while it is charging and it would be very awkward to play while it's docked in the charging cradle. They went up just after 12:30pm Eastern time. My receipt shows 12:41. That said, I haven't gotten a shipping confirmation yet, just an order confirmation. The cradle is nice for me, because I forget to plug it in after charging. It will make my 3DS XL look more important by having it's own charging dock. 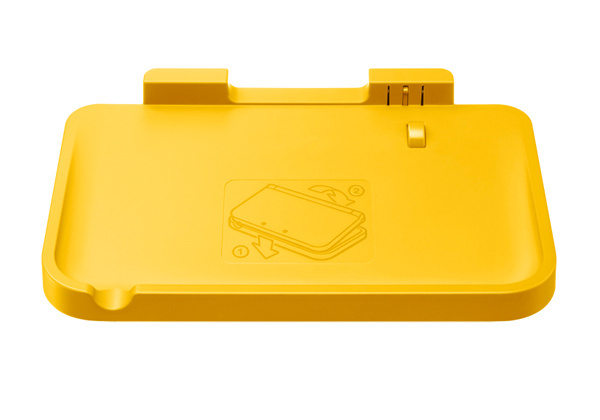 The 3DS XL only charges what and when it needs to. You don't need to charge it only when it runs out of battery, so the cradle keeps it charged and makes stuff look fancy. Just some insight about why I think it's nice. Try next time guys. There will be less people refreshing their pages this time. I'm thinking there was at least 500 of each color. I was checking all morning for them. When I finally saw they had come up, it had been about 20 minutes since the last time I checked. Red and Blue were already sold out (I wanted Blue), so ended up with green. They were all showing sold out when I checked again half an hour later. I managed to grab three: a yellow one for my Pikachu 3dsx, one red for my Pokemon Red one, and a green one just in case I decide to buy Luigi's. Also, since I'm definitely buying the Zelda 3dsxl, a green cradle would fit it nicely. Sift started just before they were actually up on the site. I was pretty pissed by my first break. I could have got a yellow one but at the last moment decided to pass since I don't really need one. I got the blue one... or at least I hope I did. Yesterday, I got three different confirmation emails with different order numbers. On my CN account it said I had ordered three of them, but I was only charged for one. Today, they canceled two of them, but one of the ones they canceled was the one I paid for. Luckily I got a red one but I wanted a blue one. I wanted the green one and got it just before the site crashed, but I got it. Now...will I use it? Got the Red, Blue and Yellow ones for each of my L/E Pokemon systems. So aggravating...I couldn't get one because I was at school at the time. Got a white one .... Pretty sweet special ... Second time I use my coins since I got my animal crossing stylus case for 300 coins !! I got the yellow cradle to go with my black 3ds xl. I'm worried though because the site was messed up and it took me several tries to get my order through. One of the times it crashed on the last step. My order history ended up showing two orders for the cradle: one for 0 coins and one for 500 coins. I just checked the status of my orders and the 500 coins one was cancelled and the 0 coins one is still in preparing order. I even got the 500 coins back in my account. I'm not sure what to do. I didn't really find these worthwhile, so it's not a big deal that I missed out. To those wanting them to bring back the golden nunchuck I say: I hope they don't. It's already been up twice and you missed it. Sorry. It's cool because it's limited in quantity. If everyone had it it'd be a lame collectible. I grabbed a red one in the first 5 minutes, but it wasn't easy. The site was sluggish, and when the page loaded with the button to complete my order, the page looked barebones and nothing would happen when I clicked the button, so I had to reload the page to get it to render properly with a button that worked. @C-Olimar Not so. Video games contain chips which include games to play. This "charging cradle" is useless, just a flat piece of plastic for the system to sit in while it charges. It doesn't even speed up charging or anything, so, again, it's pretty useless. How much do you think 500 coins on the Club Nintendo website is worth? If we assume 5 coins per game you download, going at $5 a game, that means you're paying $100 for a piece of plastic. You can buy the cradle for $19 (someone said above) online. In fact, NONE of the rewards are really worth it. I don't mean to sound ungrateful because rewards are nice n' all, but I would much rather download a game for coins than buy a piece of useless plastic. @grumblegrumble yeah, but they sell for $19.99 plus $5 shipping on Nintendos site. Not available at retail. @Nico07 $25 is a lot better than $100, imho! I'm just surprised people grabbed 2 or 3. That's probably another reason why they went so quick. There's NO WAY Nintendo could have supplied enough if people were grabbing more than they thought they would. I grabbed 2, Only because I have 2 3DS XL's... well, I will on the 22nd... It's already completely paid off. @grumblegrumble True lol, at $100 there is no way I would buy one at $25 I considered it. But for those who managed to get one with 500 points it is worth it IMHO. You don't just rest it in the Cradle, The Cradle actually Charges it. It a Drop-and-Charge / Pick-up-and-Play thing! Better ban these, the bright colors will hurt kids eyes. @grumblegrumble I think we are on the same page. $100 is crazy, $25 is considerable. Not necessary unless you liked having one like the original 3DS came with and have kids that play your 3DS. I've already had to replace a broken charging pin for a DS back in the day. This device takes the possibility of damaging the pins out of the equation. I actually got one!!! I anticipated this, and watched the website like a hawk. I bought one ten minutes after they were posted! got me a sweet sweet blue one to match my XL. thank god there was something worthwhile to spend my zillions of dusty coins on!!!! Getting red and yellow if they ever come to Europe. I don't mind paying up to 7000 stars for both...As there is no matching cradle for my Pikachu. I do wish they also release a gold one for that new Zelda XL. I got nothin'. Oh well, back to having nothing to spend my coins on, again. I did not sleep at all the night of the 30th, and stayed up till just after 12 pm eastern standard time.. I wanted a blue one but it wouldnt take the order, so I tried the white and after 17 attempts..I snagged one! white goes with near anything. Would have been neat if they were for the regular model as well. Got mine just in time.. I was planning to get Blue or Red but it sold out in like minutes.. After 10 minutes of my order, everything pretty much was out of stock lol! I snagged a blue one! But dang they sold out fast! @KnightRider666 I see they are trying to sell them for $49.99. Zero bids and 6 hours left. Peeps in China are selling the for $35-40. Sad. Just sad. @grumblegrumble: Your loss is their gain unfortunately, but it beat not being able to get one at all. Bring back Luigi's Hat/Case and the Luigi Basket, Nintendo! It's, supposedly, his year, right? I spent so much effort (and a bit of cash) trying to get up to 500 points just to get one of these. Then I almost forgot all about it! Thankfully I checked the site from work and managed to grab a red one. I can't believe they went so quickly.